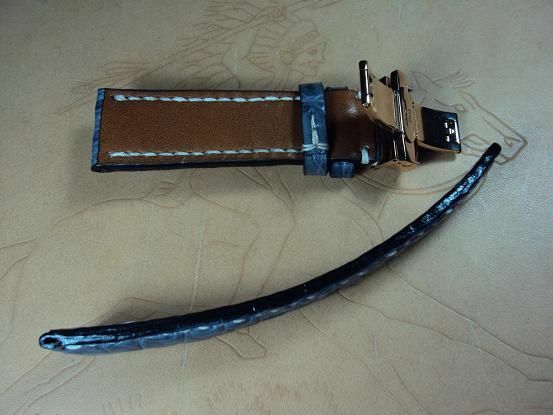 Here are some IWC, ROLEX deployant crocodile strap, and a HAMILTON custom black croco strap and Bund style custom straps IB01~IB12,including OMEGA custom straps which have sold by way of some custom strap orders. 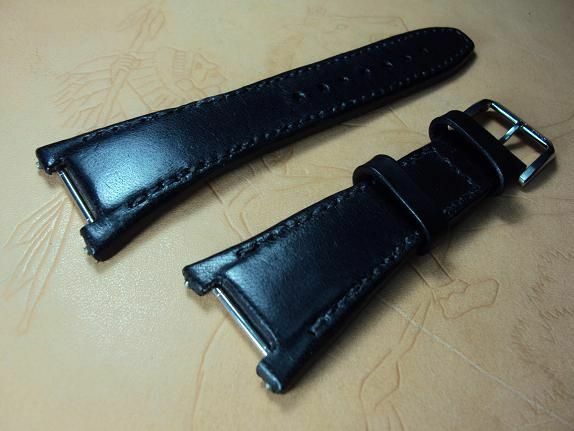 IB01 Custom strap Bund style black leather strap, 28(35)x28mm, 65x110mm, black stitch. 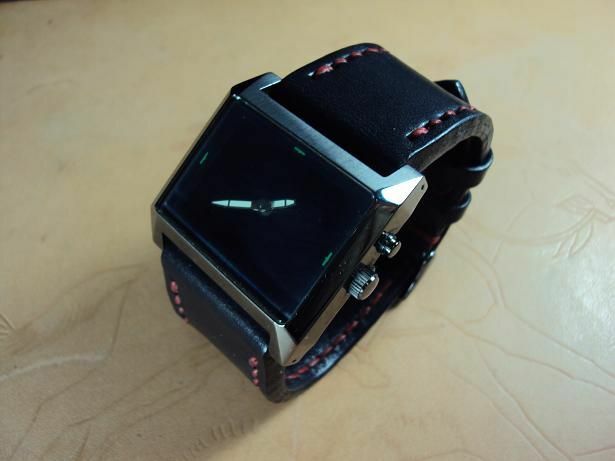 The bund style black cowskin strap is priced at $ 160 USD. 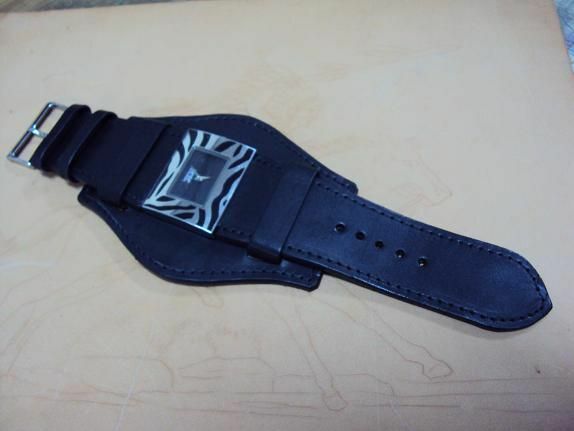 IB02 Custom IWC black little horn crocodile deployant strap, 18x16mm, 85x140mm, havy padded 6.0~2.2mm, black stitch. 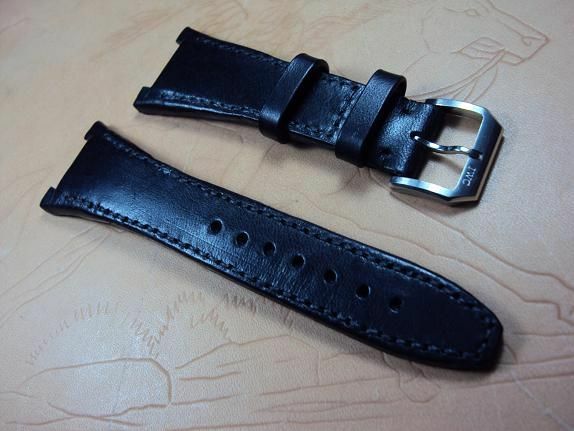 The heavy padded leather strap is a very difficult leather product. After that we sew together with the upper croco skin,the middle curved calf board pad and the back side calf lining. 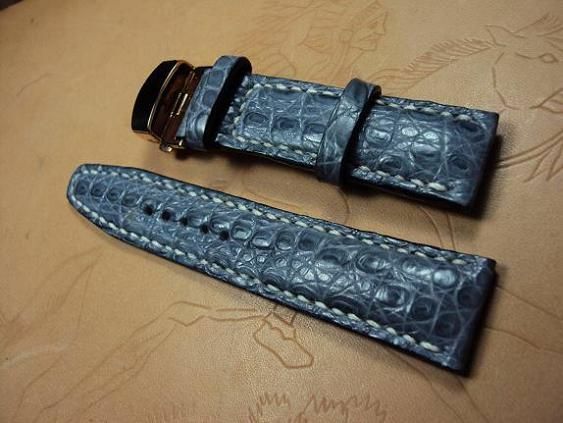 Due to that our padded crocodile custom strap will be more durable, clean and anti-allergenic during the wearing period. The heavy padding little horn croco strap is priced at $ 220 USD, now charges the promotional price at $ 170 USD including registered airmail worldwide shipping. 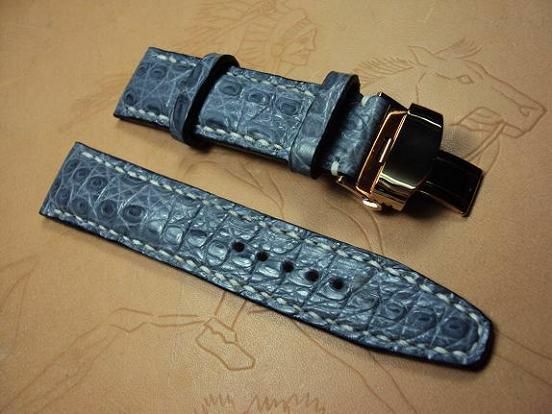 IB03 IWC heavy padded grayish blue crocodile strap, 22x20mm, 72x115mm, white stitch. 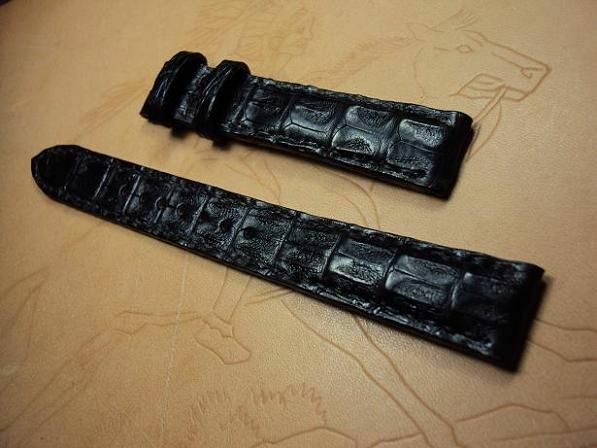 The heavy padding croco belly strap is priced at $ 200 USD, now charges the promotional price at $ 150 USD including registered airmail worldwide shipping. 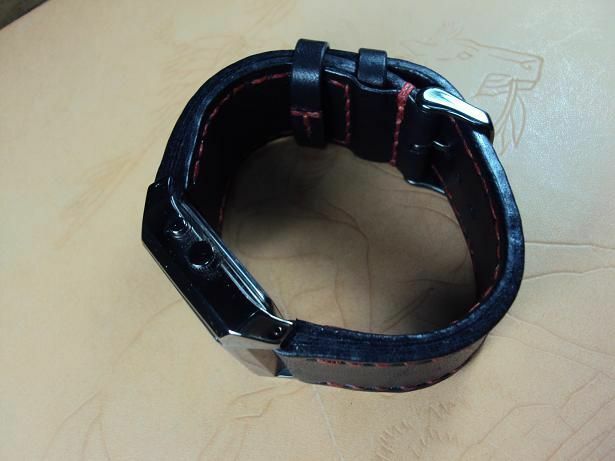 IB04 FOSSIL ultrasoft black vintage leather watch strap, 28x28mm, 75x125mm, thick 4.5mm taper to 3.5mm, red stitch. 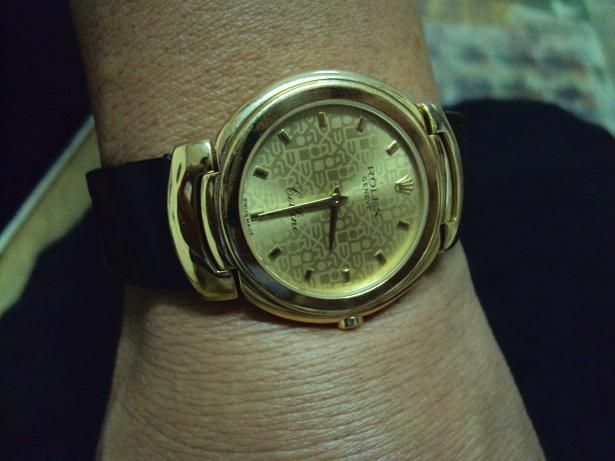 It is priced at $ 140 USD, now charges the promotional price at $ 90 USD including registered airmail worldwide shipping. No including the buckle. 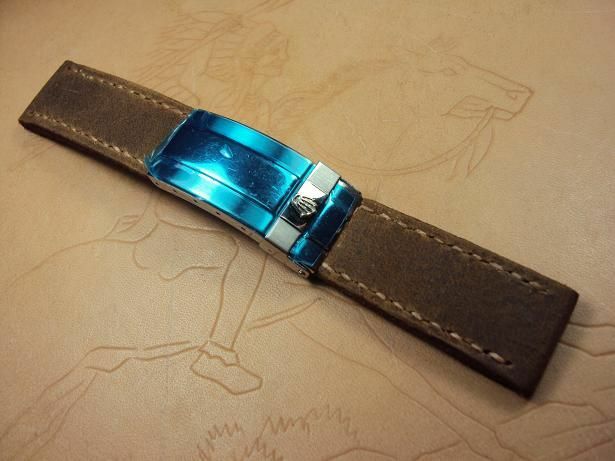 The buckle is an optional item that charges $ 15 USD. 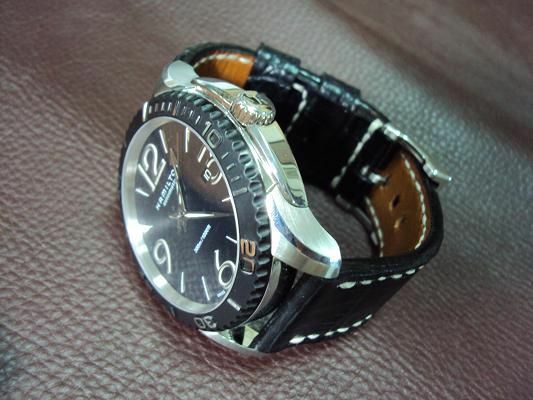 IB05 IWC Big Ingenieur black vintage leather strap, 19(28)x18mm, 75x115mm, thick 5.5mm taper to 4.0mm, black stitch. 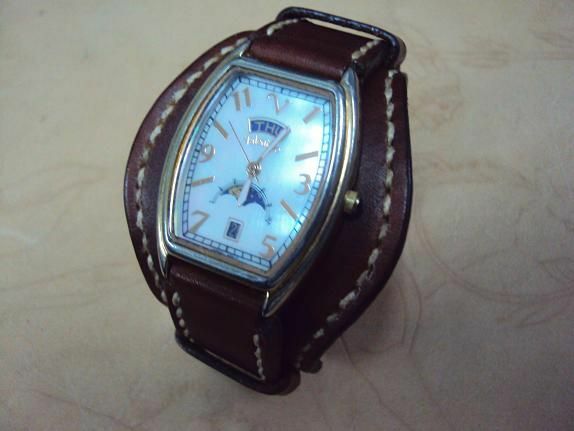 The IWC Ingenieur custom leather strap is one of the most difficult hand made leather watch strap. After that we sew together with the upper side cow leather,the middle metal insert layer and the back side calf lining. Due to that our IWC Ingenieur leather strap will be more durable, clean and anti-allergenic during the wearing period. 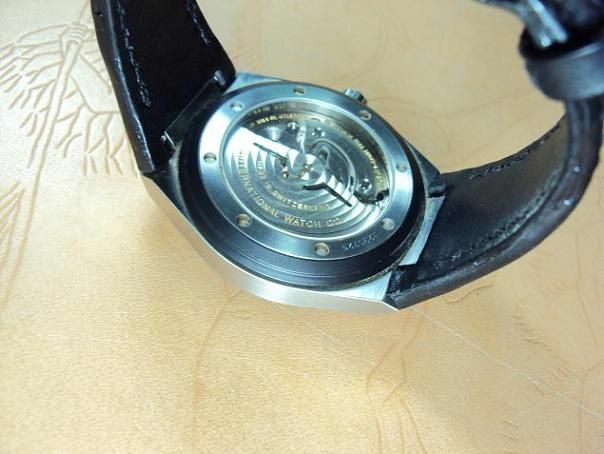 Please notice that this IWC Big INGENIEUR custom leather strap service is limited only for sending me the IWC Big INGENIEUR old strap to produce the middle layer of the new custom strap. 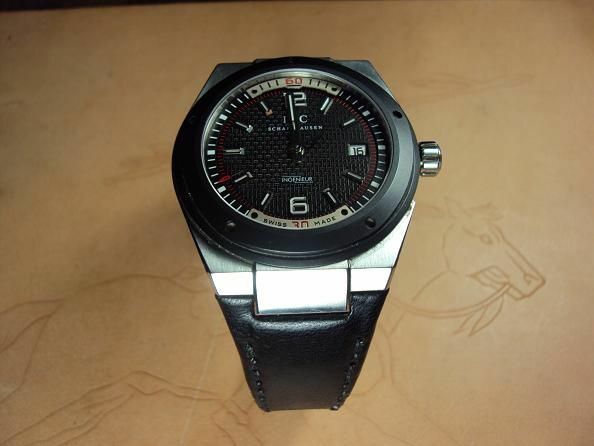 The custom IWC Big Ingenieur black vintage cowskin strap is price at $ 300 USD, now charges the promotional price at $220.00 USD. No including the buckle. Shipping for Express Mail Service please plus extra $ 24 USD. 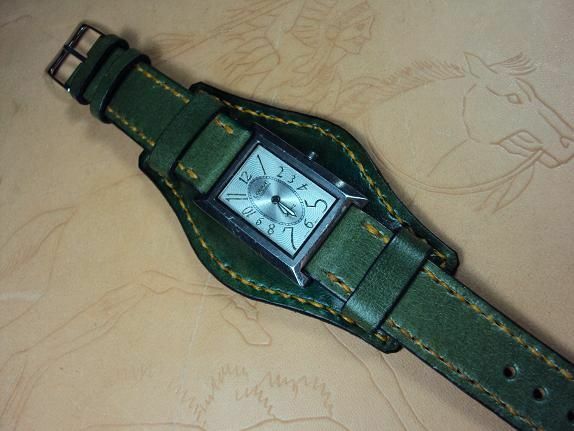 IB06 LOBOR Bund style olive-green leather watch strap, 19x18mm, 65x105mm, orange stitch. 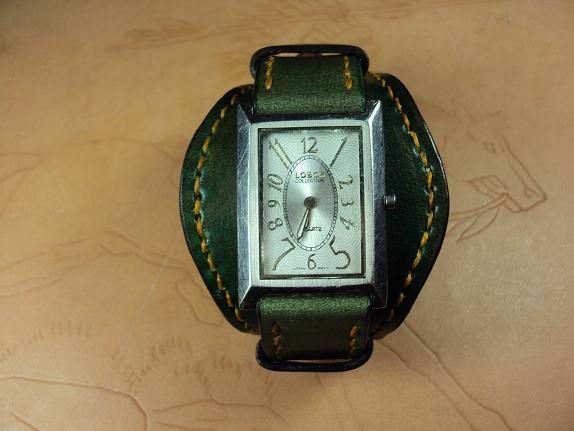 The bund style olive-green cowskin strap is priced at $ 160 USD. 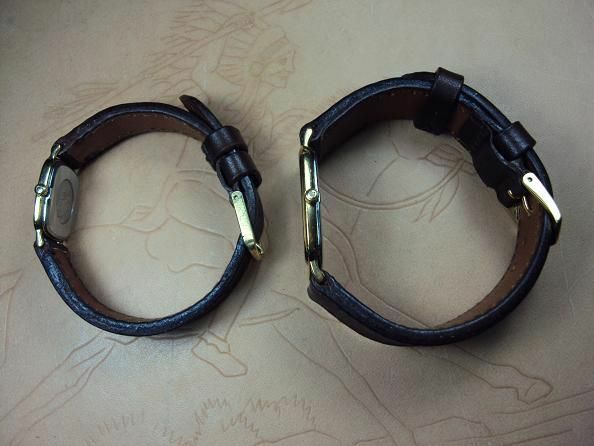 IB07 OMEGA custom straps, 18x18mm, 70x125mm, and 13x12mm, 60x115mm, chocolate brown leather straps, dark brown stitch. 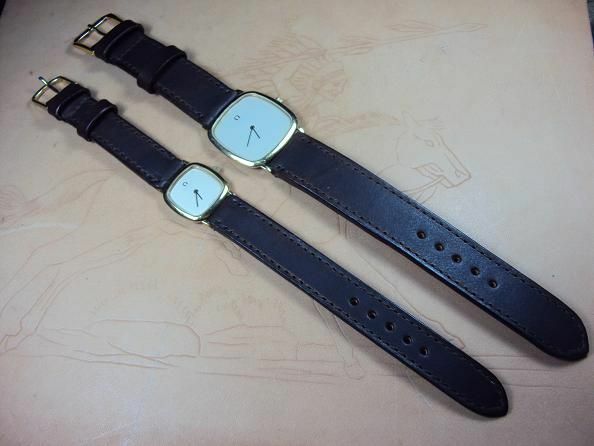 Each one of the chocolate brown leather straps is priced at $ 120 USD, now charges the promotional price at $ 70 USD including registered airmail worldwide shipping. No including the buckle. 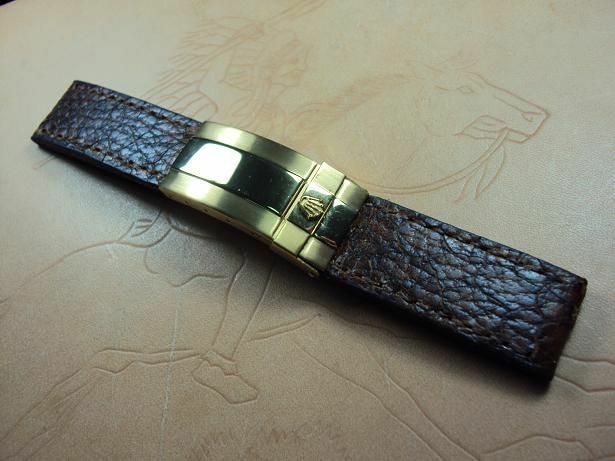 IB08 ROLEX Crazy horse leather deployant strap , 20x18mm, 50x80mm, thick 4.0mm taper to 2.8mm, dark cream stitch. 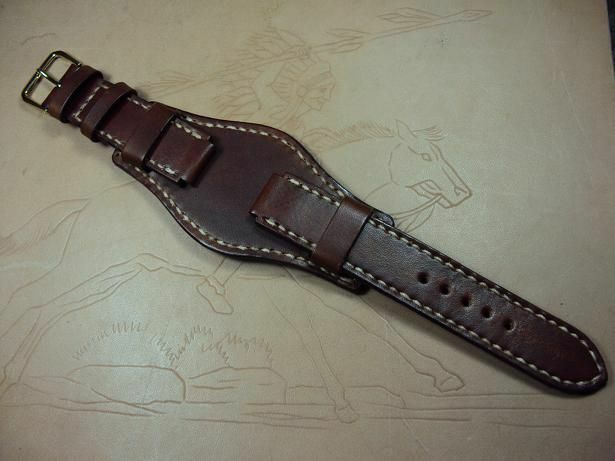 The Crazy horse strap is priced at $ 160 USD, now charges the promotional price at $ 110 USD including registered airmail worldwide shipping, or plus $15 USD for EMS shipping. No including the deployant clasp. 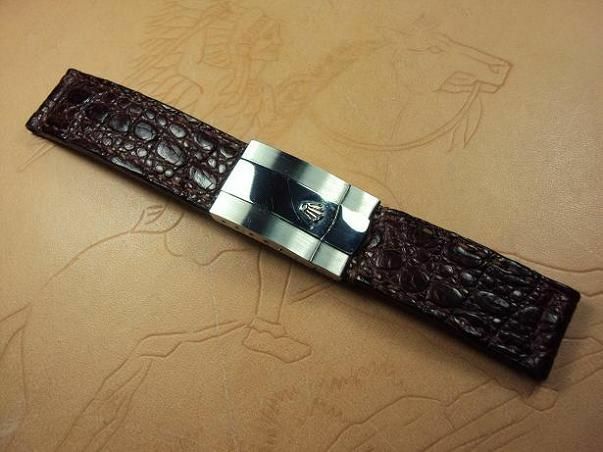 IB09 ROLEX dark brown crocodile deployant strap, 20x18mm, 50x80mm, thick 4.0mm taper to 2.8mm, brown stitch. 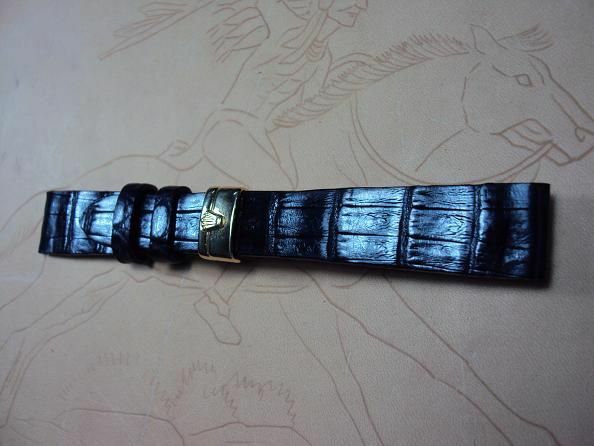 The dark brown croco strap is priced at $ 180 USD, now charges the promotional price at $ 130 USD including registered airmail worldwide shipping, or plus $15 USD for EMS shipping. No including the deployant clasp. 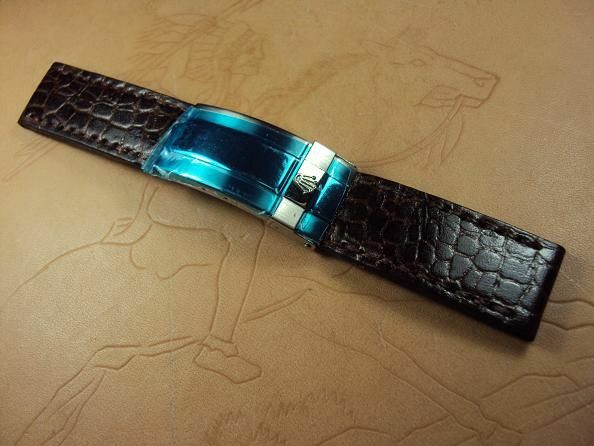 IB10 ROLEX dark brown crococalf leather deployant strap , 20x18mm, 50x80mm, thick 4.0mm taper to 2.8mm, dark brown stitch. The crococalf strap is priced at $ 130 USD, now charges the same promotional price at $ 80 USD including registered airmail worldwide shipping. No including the deployant clasp. IB11 ROLEX ultrasoft Italy ice crack grain leather deployant strap , 20x18mm, 50x80mm, thick 4.0mm taper to 2.8mm, dark brown stitch. 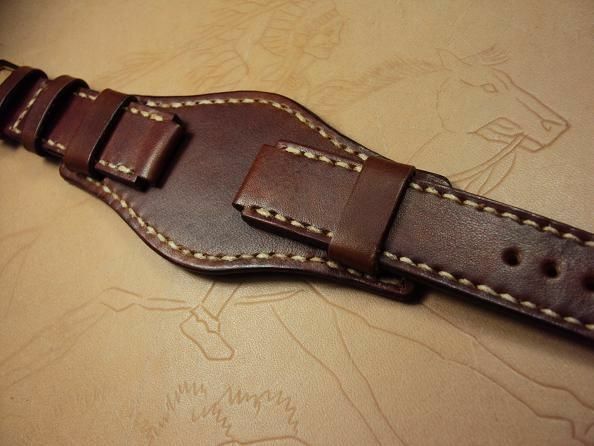 The Italy ice crack grain cowskin strap is priced at $ 150 USD, now charges the promotional price at $ 100 USD including registered airmail worldwide shipping, or plus $15 USD for EMS shipping. No including the deployant clasp. 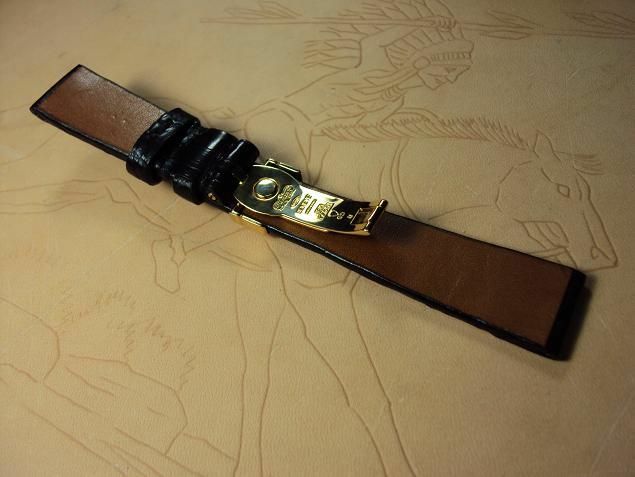 IB12 Valentino chocolate brown grained leather bund style strap, 15.5(20)x20mm, 70x120mm, thick 4.0mm taper to 2.8mm, cream stitch. 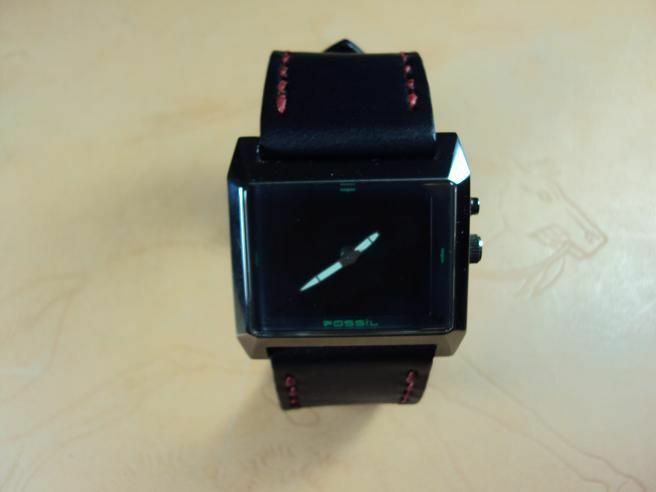 The bund style black cowskin strap is priced at $ 160 USD. No including the buckle. 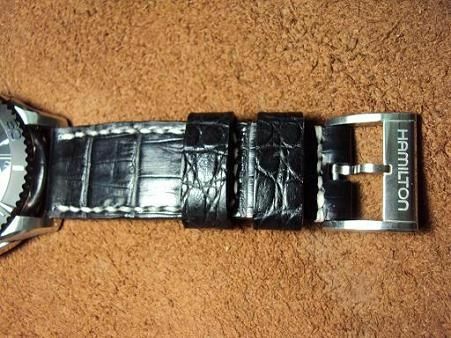 IB14 Rolex black crocodile deployant clasp strap, 17x13mm, 55x110mm, thick 2.5mm taper to 1.8mm, calf lining. The black croco strap is priced at $ 180 USD, now charges the promotional price at $ 130 USD including registered airmail worldwide shipping. No including the deployant clasp. 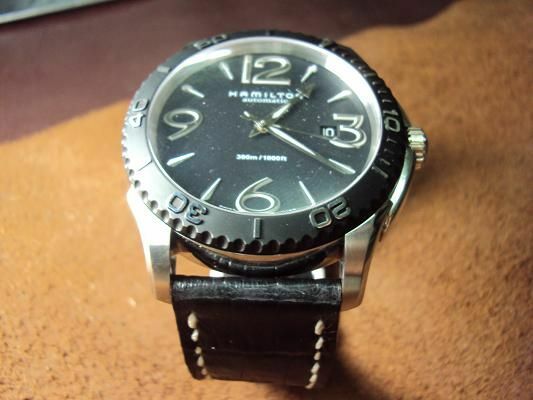 Here is one HAMILTON custom black crocodile strap, no including the buckle. 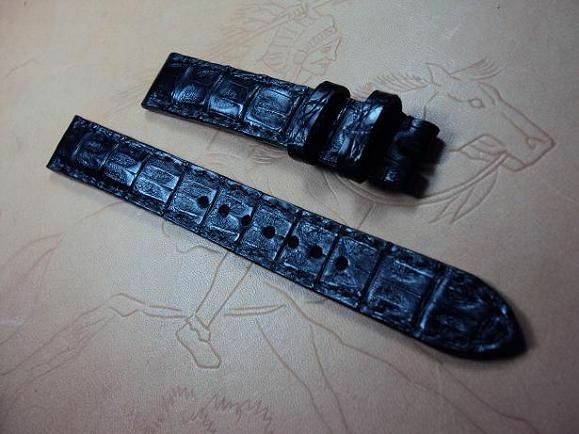 IB15 HAMILTON black crocodile belly strap, 24x22mm, 80x125mm, thick 4.0mm taper to 2.5mm, white stitch.